This quirk demonstrates how the different administrative distances of BGP, combined with the Best Path Selection algorithm can cause asymmetric routing if redistribution isn’t done carefully. As a reminder, each blog will follow 3 sections: The quirk, the search and the work. The quirk describes the problem, the search shows how a solution was reached and the work shows the technical and CLI aspects. The network consists of an MPLS core with multiple remote sites (only one is shown here). There is a dual homed breakout site, which passes through a firewall (performing security and address translation services as normal) and onwards to an internet facing WAN connection. A default route is learned over eBGP from the Provider Edge router (PE4) connected to the internet facing Customer Edge router (CE4). This is redistributed into OSPF. The MPLS facing Customer Edge routers (CE1 and CE2) redistribute OSPF into BGP using the redistribute ospf 1 match internal external 2 command. The default and local 10.200.0.0/24 routes are advertised to the Provider Edge Routers (PE1 and PE2) and into the MPLS core. PE1 gives the routes received from CE1 a local preference of 200 making this WAN link preferred. 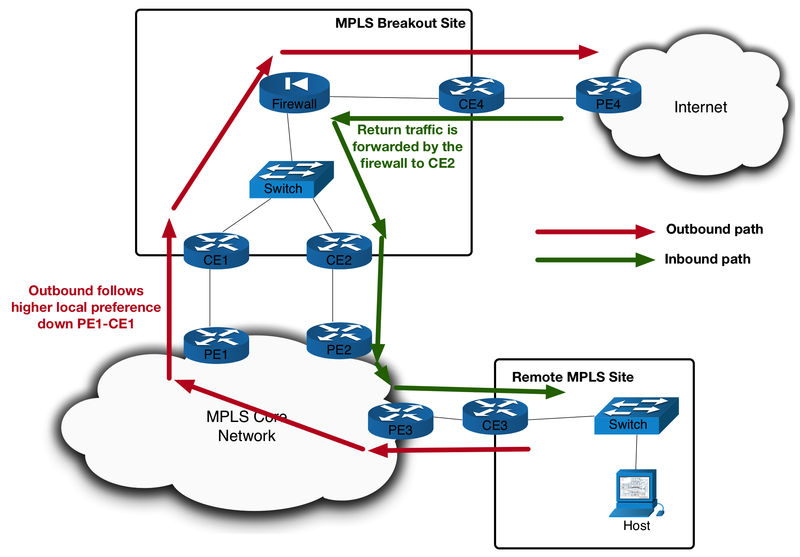 So that the breakout firewall has a path back to the MPLS sites, every MPLS sites range is advertised through eBGP into the MPLS core before being sent to CE1 and CE2 and redistributed into OSPF. The quirk comes into play when you consider that, at this stage, no filtering of any kind is applied to the redistribution. Combine that with the order in which the BGP sessions of CE1 and CE2 establish and we quickly see problems with return traffic from the internet headed back to an MPLS site. CE2 establishes its eBGP neighborship to PE2 before CE1 establishes it session to PE1. CE2 learns about the MPLS LAN ranges from PE2. These eBGP learned routes have an AD of 20. CE2 redistributes these eBGP prefixes into the OSFP link state database (LSDB). CE1 receives the Type 5 LSAs and installs these prefixes into its RIB. These OSPF prefixes have an AD of 110. 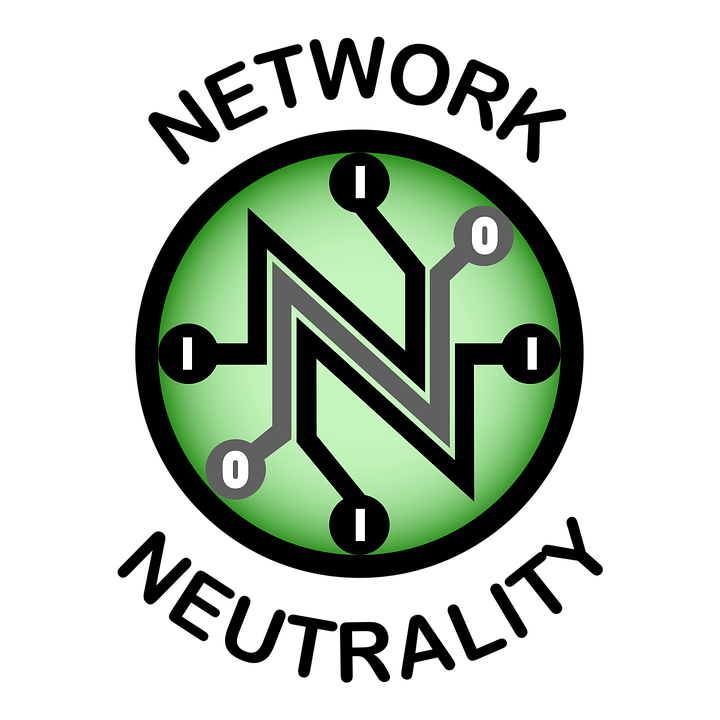 Without filtering, CE1 will redistribute these into BGP. BGP will give them a weight of 32,768 (because they are redistributed and thus locally sourced). Another, and sometimes overlooked, aspect is that these locally generated routes will be given an AD of 200. CE1 now establishes its neighborship to PE1 and receives the prefixes for the MPLS sites over eBGP (just as CE2 did). These eBGP prefixes are installed in the BGP RIB and have an AD of 20. They have a weight of 0 since they are learned from a neighbor. OSPF has one only E2 route, which has an AD of 110. So OSPF puts this forward. However the BGP Router process has two options to choose from. It runs through the BGP Best Path Selection Algorithm to decide (for a reminder of its steps take a look at this document). CE1 looks at its options and chooses the routing source with the lowest AD, which in this case is OSPF. As a result the OSPF route is installed in the IP RIB. CE1 does not even redistribute its eBGP learned prefixes into OSPF. Redistribution takes place from the IP RIB and there are no BGP routes in there. Because of this, the breakout firewall only sees routes for the MPLS sites from CE2 and sets CE2 as the next hop. From here, we can see that traffic leaving a remote MPLS site destined for the internet, will go out via the primary CE1-PE1 link. However return traffic will go back via the CE2-PE2 link. Of course if CE1 establishes its BGP session first this is not an issue, however that is far from ideal. We needed to look at a way to either make sure CE1 brings up its BGP session first, prevent CE1 from learning routes from CE2, or prevent the redistribution back into BGP from OSPF. There are a number of ways to tackle this issue. Some better than others. when Primary Routers WAN link comes up"
action 2.0 cli command "event timer countdown time 60"
action 3.0 cli command "enable"
action 4.0 cli command "clear ip bgp 10.10.1.6"
action 5.0 cli command "end"
In short, CE2 would track the PE1 WAN interface. A static route has been included to make sure that it tracks it by going through CE1 (rather than its WAN connection). If this tracking object came up, CE2 would clear its BGP session. There is a delay timer put into the script to allow a minute for CE1 to bring up its BGP session. There is a major problem with this approach however. Just because the WAN link is up doesn’t mean the PE1-CE1 BGP neighborship is up. The neighborship could drop for some other reason, without the link failing. If this happened CE2 would never clear its BGP session. Plus, even if the tracking worked as expected, it might be deemed too disruptive to hard clear a BGP session for such an important site. As we will see, there are better options available. A second possible approach involves preventing CE1 from learning any OSPF routes from CE2. This can be accomplished using a distribute-list. A distribute-list sits between the Shortest Path First calculation and the IP routing table. It doesn’t stop prefixes from entering the LSDB or affect the best route OSPF chooses. But it will prevent routes moving from the LSDB to the IP Routing table. If a distribute-list is applied inbound and allows only the local LAN ranges and the default route, then the MPLS site prefixes will never enter CE1s IP RIB from OSPF. Since redistribution is performed from the IP RIB, they will never show up in the BGP table. This configuration works just fine but there is a third option that makes use of tagging and allows for a cleaner approach. This third option is outlined in the work section below. It involves making use of tagging and filtering using route-maps. When prefixes are advertised to CE2 over eBGP and redistributed into OSPF, we can tag the prefixes. We can then configure a route-map on CE1 that only allows prefixes that do not have this tag to be redistributed into BGP. Let’s explore the configuration of how this would be achieved. 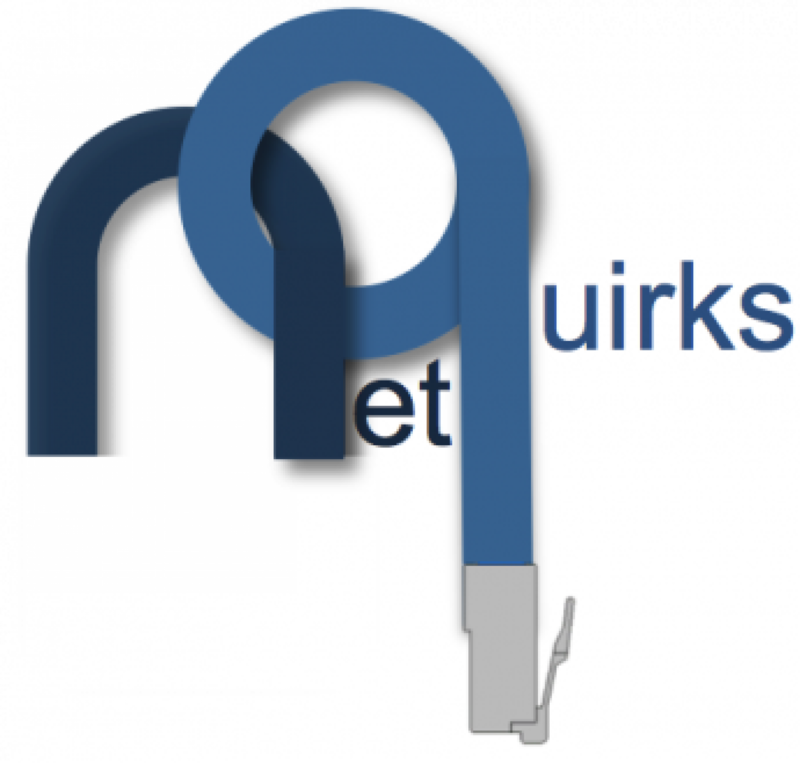 Three MPLS sites are represented by loopbacks on the router named LNS (representing an L2TP Network Server in name only. It is simply a 3725 running BGP and MPLS). The ranges for these MPLS site are 192.168.1-3.0/24. A loopback with IP 50.50.50.50/32 on the INTERNET router (the cloud image) is used to simulate a public IP. Note that CE1 has a lower cost when redistributing routes. This is to ensure the breakout firewall will prefer going via CE1 given the option. *> 0.0.0.0 10.200.0.1 5 32768 ? *> 10.10.1.0/30 0.0.0.0 0 32768 ? * 10.10.1.1 0 0 100 ? *> 10.10.1.4/30 10.10.1.1 0 100 ? *> 10.200.0.0/24 0.0.0.0 0 32768 ? *> 99.99.99.0/29 10.200.0.1 2 32768 ? *> 100.100.100.0/30 10.200.0.1 20 32768 ? * 192.168.1.0 10.10.1.1 0 100 ? *> 10.200.0.253 10 32768 ? * 192.168.2.0 10.10.1.1 0 100 ? * 192.168.3.0 10.10.1.1 0 100 ? The path via 10.1.1.1 has a weight of 0 since it is learned from an eBGP neighbor (as the word external implies). The path via CE2 is locally sourced (as the word sourced and the Local AS path imply) and has a weight of 32,768. Because of this, the second path, which has AD 200, is chosen as the best path and ultimately loses out to OSPF. Now let’s look at fixing this using route-maps and tagging. The first step is to configure CE2 to tag any eBGP routes that it redistributes into OSPF with tag 10. *> 192.168.1.0 10.10.1.1 0 100 ? *> 192.168.2.0 10.10.1.1 0 100 ? *> 192.168.3.0 10.10.1.1 0 100 ? Success. The route-map has successfully blocked the OSPF being redistributed into the BGP table. 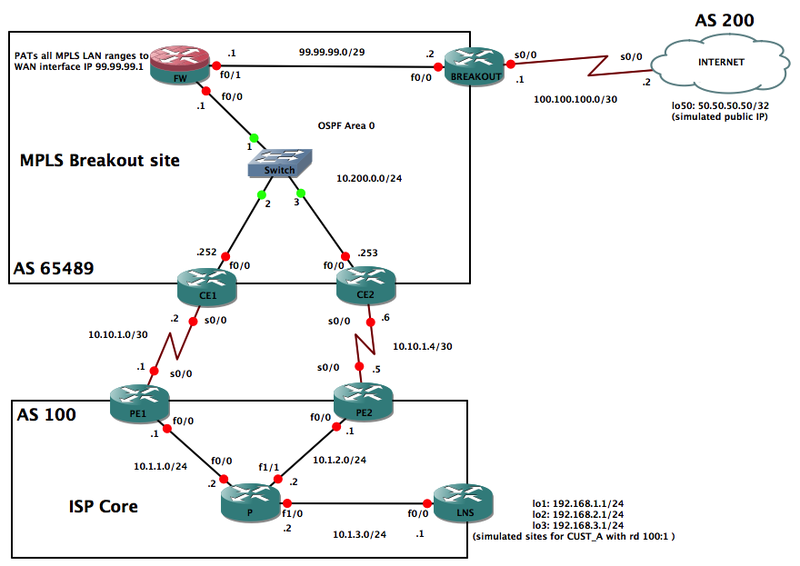 As a result the route that the BGP Router process puts forth is the eBGP route, which wins over OSPF with an AD of 20. However in this network scenario, there is no real reason to redistribute the MPLS sites back into BGP. It is safer to block them entirely. It’s also prudent to apply this configuration in the opposite direction as well (tag redistributed routes on CE1 and block them on CE2). And finally, you might have noticed the route-maps applied inbound and outbound on the eBGP sessions in the base config shown above. These are done to avoid routes looping from BGP to OSPF and back into BGP. MPLS solutions often have multiple sites with the same private AS number meaning allowas-in or as-override must be used to bypass BGP loop prevention (whereby a router running BGP will ignore updates for prefixes that have its own AS number in the AS_PATH attribute). This tagging could easily be used on the outbound advertisements, instead of the prefix-lists shown above. Tagging is more dynamic than manually defining the local ranges using prefix-lists. Looks good. Routing is symmetric and as expected. There more ways to solve this problem than I have shown here. Feel free to play around with the lab to see what you can come up with. Feeback is more than welcome. Let me know if you found this blog useful or interesting. Thanks for reading.